On March 2, and April 22, 1959, forty-five minutes of the most profound music in jazz history was recorded. Kind of Blue is considered the musician’s Bible. It is, one of, if not the best selling jazz albums of all time. This masterpiece was recorded in just two sessions and it is certified triple platinum. There isn’t much I could add to the praise that has already been given to the genius of Miles Davis and his music. The Missouri Historical Society in St. Louis presented an exhibit celebrating his 75th anniversary in 2001. It was a once in a lifetime experience and I spent 3 hours viewing photos and listening to audio that chronicled his life. After that, I wanted to buy every Miles Davis CD as well as every musician associated with him. Enjoy your music. This entry was posted on Friday, June 13th, 2003 at 7:56 am. It is filed under Flashback Friday and tagged with Bill Evans, Flashback Friday, Jimmy Cobb, John Coltrane, Julian Edwin "Cannonball" Adderley, Kind of Blue, Paul Chambers, Wynton Kelly. You can follow any responses to this entry through the RSS 2.0 feed. And I almost forgot to thank you for starting my weekend off just right. once again. you win! oh, and by the way… first read about kem here. well, today i picked it up. nice album. very nice album. thanks for the head’s up. 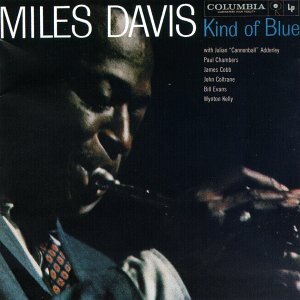 i’ve been meaning to purchase Kind of Blue since…well, forever. you give me a good reason (and a kick in the shins) to do so. good for you. I too am loving this CD… One of my favorites….